Overview - When a family of whales is trapped by rapidly forming ice in the Arctic Circle, a small-town reporter (John Krasinski, The Office) and an animal-loving volunteer (Drew Barrymore, Charlie's Angels) rally an unlikely coalition of Alaskan natives, oil tycoons and the Russian and American military to set aside their differences and free the whales before it's too late! After recently reviewing a slew of mediocre (or just plain bad) family films, I'm pleased to report that I've finally come across a genuinely entertaining and heart-warming all-ages flick. Based on actual events, 'Big Miracle' manages to be sweet and inspirational without ever becoming too saccharine, and while the film's structure might be pretty simple, it avoids the hollow, manufactured feel of similar efforts. With an extremely likeable ensemble and a moving story, director Ken Kwapis comes away with a very solid example of family entertainment done right. Adapted from Tom Rose's 1989 book, 'Freeing the Whales,' the story follows the rescue of three grey whales. Trapped in a small patch of unfrozen water surrounded by miles of ice, the animals are unable to escape. When a local newsman, Adam Carlson (John Krasinksi), covers their plight, the story goes national. As a horde of reporters descend upon the small town of Point Barrow, Alaska, rescuers work feverishly to figure out a way to move the whales before the small area of remaining water freezes over them. With the animals' lives at stake and the entire country watching, various disparate groups will have to find a way to put aside their differences and work together. Covering the elaborate mission from all angles, the script features several subplots and disconnected pieces that gradually come together as unlikely alliances are made for the sake of a greater good. A nice sense of forward momentum is forged, carrying us through the crisis at an exciting pace. A broad sense of humor helps to lighten the mood, and while simple, the comedy is effective (especially a particular moment than involves John Krasinski's tongue). The story is family friendly through and through, but thankfully the filmmakers avoid ever talking down to their audience. The movie is ultimately inspirational, but that doesn't mean that there isn't some real drama and even tragedy along the way. A few scenes involving the whales' turmoil can be quite heartbreaking, keeping the stakes high and the grave reality of the situation ever present. Though my knowledge of the actual events isn't very extensive, based on the included special features, it seems like the filmmakers stayed fairly true to history while still finding a suitable movie-friendly narrative. In fact, while some characters are composites and others are completely fictional, a lot of the movie's more unbelievable moments are completely true. The rescue efforts really are amazing to watch, and the manner in which different groups of people come together for a common goal becomes moving without being sappy. With the exception of a sleazy reporter played by John Michael Higgins, the characters are all well rounded. Sure, overall development is fairly standard and predictable, but the filmmakers do a good job of expanding upon the various characters' conflicted motivations. Themes dealing with changing times and culture clashes are also touched upon as the Alaskan natives deal with the invasion of outsiders upon their town, adding some extra conflict and substance to the drama. All of the numerous subplots end up reaching their logical conclusions, and while there aren't any real surprises along the way, the typical emotional beats are well executed. John Krasinski leads a wonderful ensemble and the cinematic everyman is his usual likeable self. Drew Barrymore's Greenpeace activist character, Rachel Kramer, can get a little annoying at times, but she has the noblest intentions and the actress has a few really nice moments. Kristen Bell and Ted Danson are also great in their roles, and while their characters aren't as lovable as Krasinski or even Barrymore's, they add some decent dimension to their parts. Dermot Mulroney and Vinessa Shaw are at the center of my favorite subplot, and their true-to-life romance is fun to watch. While the human ensemble is impressive, the real stars of the show are the whales themselves. Through a mixture of animatronics, CG, and actual news reel footage, the filmmakers create three convincing on screen characters, and it's remarkable just how expressive they can be. 'Big Miracle' is a sweet, touching family film that avoids many of the genre's common mistakes. The writers and director respect their audience and provide an experience that parents and children can enjoy together. Certain elements of the plot and characterizations are predictable and maybe a little thin, but there really is a solid amount of substance within the simple, heartwarming story. The unbelievable real life events shine brightly on screen and while there are some flaws, the majority of the film is well done. Any families looking for an entertaining and inspirational movie should definitely check this out. 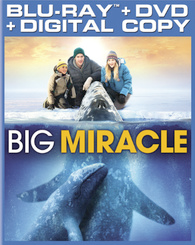 Universal presents 'Big Miracle' in a Blu-ray/DVD/Digital Copy combo pack. A BD-59 flipper disc that houses the Blu-ray version on one side, and the DVD version on the other, is included, along with a code for a redeemable UltraViolet digital copy. After some skippable trailers, the disc transitions to a standard menu. The movie is provided with a 1080p/AVC MPEG-4 transfer in the 2.40:1 aspect ratio. Crisp, vivid, and sharp, the film looks gorgeous on Blu-ray. The print is in pristine shape with a light layer of grain present throughout. The image boasts a great sense of clarity and dimension, with plenty of readily visible fine details and textures. The remote Alaskan setting comes to life beautifully, perfectly rendering the shimmering, icy waters. The clean, white snow carries a brilliant, high contrast (but never blinding) sheen. Colors are richly saturated, resulting in a vibrant yet still believable palette. Black levels are deep and inky without crushing shadow detail. With pleasing colors, clarity, and depth, 'Big Miracle' comes to Blu-ray in a pretty immaculate transfer. The filmmakers reliance on authentic locations and practical effects really pays off, and though a few CG shots stick out a bit, the image is quite impressive. The film is presented with an English DTS-HD MA 5.1 track, a DVS Dolby Digital 2.0 track, and a Spanish & French DTS 5.1 track. Optional English SDH, Spanish, and French subtitles are included. Spacious but not overbearing, the mix offers a nice sense of balance and immersion. Speech is clean, clear, and easy to hear throughout. The soundstage has a nice, full quality with appropriate directional and disperse effects spaced around the room. Rustling winds add pleasing atmosphere to the icy locations and the whales' songs come through with strong fidelity. Dynamic range is great and the film's score and music selections provide decent low frequency activity. Balance between score, dialogue, and effects is handled well. While there aren't many real standout or demo worthy sequences, the track maintains a steady level of auditory cohesion with suitable ambiance. Technically proficient and occasionally enveloping, there are no real complaints here. Universal has provided a decent assortment of supplements including a commentary, deleted scenes, and some featurettes. All of the extras are presented in 1080p with Dolby Digital 2.0 audio and optional English SDH, French, and Spanish subtitles. Feature Commentary with Director Ken Kwapis - The director provides a good but surprisingly formal commentary. Kwapis comes across as friendly and informative but seems to be reading from prepared remarks. He goes through the standard assortment of production trivia, touching upon locations, casting, and challenges faced during the shoot. The real world inspirations for the story and characters are also detailed, revealing just how close or different certain aspects are. The most interesting tidbit involves info on how the script finally got made, and it's revealed that early drafts were much more faithful to the source novel and featured a cynical, satirical tone that is now completely absent. Some of the director's comments can veer too close to simple plot summary and there a few pauses, but this is still a worthy track. Deleted Scenes (HD, 7 min) - Four deleted scenes with introductions by the director are viewable separately or together. None of these excised bits are particularly memorable, but a scene focused on a whale fanatic might be worth a laugh or two. Truth is Stranger than Fiction (HD, 12 min) - This featurette details some of the real life inspirations for the story and characters. News reel footage is presented of the actual events and though dramatized and expanded upon, it appears that many of the movie's major and even minor beats are all fairly accurate. An increasingly rare example of a family film done right, 'Big Miracle' is a sweet, inspirational movie. The ensemble cast of likeable performers do a nice job, and while certain aspects of the scripting are a little simplistic, the unbelievable real life events provide some memorable on screen moments. The disc features a great video transfer and a very nice audio mix. Supplements are a little slim but interesting, offering some cool behind-the-scenes footage and details on the true life events. A fun, heartwarming tale, this release gets an easy recommendation for any parents looking for a good film that they can watch and enjoy with their kids.